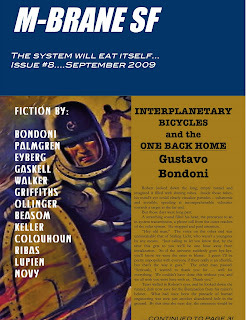 Here's the front cover and table of contents for M-Brane #8, due out by September 1. I am quite happy with the selection of stories this time. 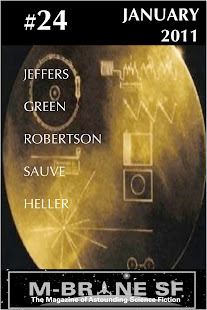 It's fairly heavy on hard science fiction, but has some variety of flavors for readers who may not be in the mood for that. We have the usual range of frequently published writers, including some Clarion alumni, along with some fairly new writers. Walker, Griffiths and Novy have appeared in M-Brane before, and three of these writers also have stories forthcoming in Things We Are Not (Gaskell, Walker and Griffiths). The styles and themes range from super-science (Palmgren and Bondoni) to alien-planetary misadventure (Ribas and Keller) to cyberpunk (Beasom) to humorous erotica (Novy) and many other things in between and among. MICHAEL D. GRIFFITHS: Who Are You? While this news is a big deal in my little world, I hate to distract from today's earlier post about Barron's plan to form a LGBT writer's alliance, so continue reading down the page and catch that as well. It is an honor to be included in this ToC. Glad to have you in it, Jamie. Your story is wonderful and I know everyone will enjoy it! On another topic: Oh. Bloody. Damn. I just noticed that this would be an entirely all-male-writer issue were it not for the Deborah Walker story. Let me just say right now that I was in no way intending to pull a Mammoth-Book-of-Mindblowing-SF stunt. Egads! Another thing of note: this may be one of our most multinational issues with the US, Canada, UK (with England and Scotland each represented separately) and Argentina. I think Bondoni is the first South American writer I have published so far. We have Brits and Canadians all the time and have had an Aus/NZ writer or two, but haven't had any African or Asian continent writers yet (issue 7 had two writers from Japan but I think they were both Brits living in Japan). Another awesome cover design. Love it. Looks like a cool issue, Chris. Variety is the spice of life, and this issue seems to have plenty of it. Thanks for including my story in the forthcoming issue. I am working on something which I will submit for you to run your eye over. Thanks again and I'm looking forward to receiving the next issue.